Boasts some of the area's best hiking and fishing! 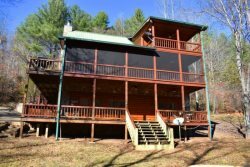 This impressive cabin is located minutes from downtown Blue Ridge in the Aska Adventure Area, which boasts some of the area's best hiking and fishing! It has 3 beautifully decorated levels starting with the main level consisting of a bedroom with a King bed and private access to the wraparound porch with an outdoor wood burning fireplace, large kitchen and dining area, cozy living room with rocked gas log fireplace. On the upper level of the cabin it has a spacious loft complete with Queen bed and flat screen TV, as you continue through the door into the Master suite you will see the grand King bed, the Master bathroom encompassing a shower and jetted tub, and double doors leading onto the private porch overlooking the miles of mountain views. The lower and final level of this mountain cabin has the last 2 bedrooms with two full beds in one room and a queen bed in the other, the game room that includes a pool table/ping pong combination table, a full bath, and a relaxing sitting area that includes a sleeper sofa, flat screen TV, and the cabin’s second gas log fireplace. The double doors of the basement open out to a sparkling hot tub and the second wood burning outdoor fireplace on the covered porch with a back drop of the gorgeous year round mountain views! The views from this house are absolutely spectacular!! We had a great time celebrating a family birthday spending time here. It accommodates 10 nicely!! We had a great time and accommodations were fine except we did not realize until we arrived access to bathrooms in two of the three meant going through another bedroom . It would have been nice to know this before. Dishwasher was out but we were forewarned so we made adjustments!! "We had a great time. Everything was perfect. The setup of the bathrooms could of been better in Bear Neccesties cabin for 5 couples. But we managed! It was great. Thanks for letting us in early as well." We enjoyed our stay. Everything we needed was here. Hot water is great and beds were excellent. Thank you!! Your team members are very accommodating. We always enjoy staying at your properties. Great staff! Very helpful and accommodating! Beautiful property! Lovely decor and felt like home away from home! Office staff was extremely professional and tried hard to meet customer requests. Exceptional rental experience. Thank you! I brought my advanced photography students for a three-day trip to Blue Ridge, to share my love of this area with them. From top to bottom, this house was perfect for our visit. Our favorite spot to start the day and end the day was the back porch. You can't help but reflect on how beautiful the view was and how good God is to give us that view. Thank you for opening your home to us. We thoroughly enjoyed our stay and hope to return later this year. Beautiful, quiet plenty of room. They were all very friendly and helpful! We had a wonderful stay! We love the cabin so much. It was large and beautiful and had great views! It was a beautiful place and the view was outstanding. We had a wonderful holiday there. Beautiful place in a great location. Views are gorgeous. We appreciated all the outdoor furniture. We enjoyed finding a place which allowed us to get so many family members in one place. Everyone I had contact with was extremely helpful and pleasant. Great customer service ! The view was amazing! Enough room for our family to spread out.